Labour has appointed Margaret Thatcher's favourite ad agency Saatchi and Saatchi to handle its advertising at the next general election. The slogan which won the agency the account was "not flash, just Gordon". The appointment comes amid speculation Prime Minister Gordon Brown is planning to call a snap election. 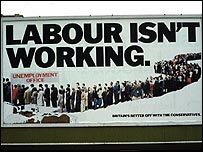 Saatchi and Saatchi's "Labour isn't working" campaign was credited with helping Mrs Thatcher win the 1979 general election. That campaign turned brothers Maurice and Charles Saatchi into household names but they left the agency they founded in 1994 to set up a rival firm M&C Saatchi. Labour's general election co-ordinator Douglas Alexander said: "I can confirm that we have appointed Saatchi & Saatchi and we are delighted to have them on board." Saatchi and Saatchi chief executive Robert Senior told Campaign that landing the Labour account was a "seminal moment" for the agency. He added: "We have the opportunity to take the strength and conviction that Gordon Brown has shown as prime minister and apply our creativity to that to do the right thing for the country." The agency's other clients include Carlsberg lager, Ariel washing powder, Toyota cars and children's charity the NSPCC. Campaign describes the appointment as "laced with irony and interest". "The idea of the agency that packaged Thatcherism turning its hand to Brownism is incredibly provocative," it adds in an editorial comment. Saatchi and Saatchi beat Labour's previous ad man Trevor Beattie and two other agencies to the account. According to Campaign, the agency impressed Labour with the "breadth and depth" of their creative ideas and capacity as a big agency. Although agencies make little money out of political accounts, the publicity they generate makes them highly sought after. How to best sell brand Brown?